Let’s talk simple economics. Whether UBS panels are more or less expensive in your area than a traditional a rock base, the fact is, more square footage can be installed in less time resulting in more cash in your pocket. It’s that simple. Time is money! 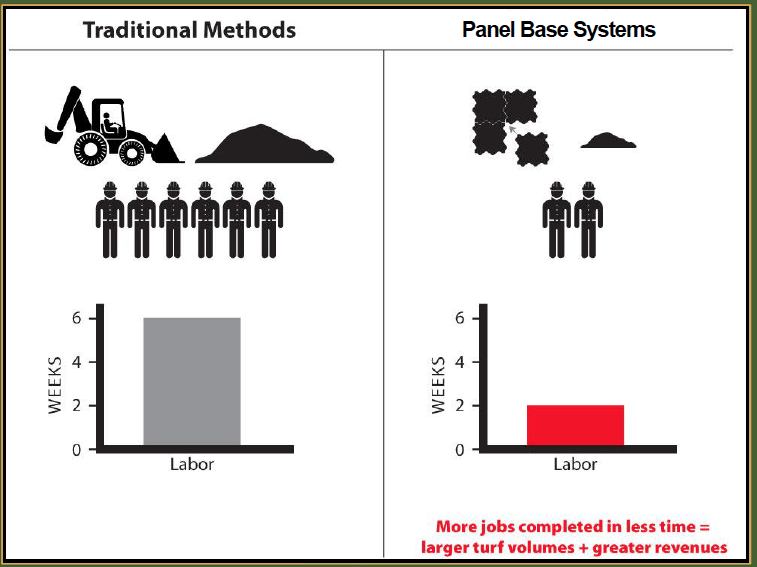 The development of our interlocking panel base technology over 12 years ago has changed the sub base preferences of the synthetic turf industry forever. What once required hundreds of truck loads of earth removal and stone installation to the site is now dramatically reduced, and in many situations, eliminated all together with UltraBaseSystems®. It takes two truckloads to cover an entire football field. Depending on the scope of the project, the installation time for UBS takes hours- not days, not weeks! This is a huge savings in transportation and labor fees. When it comes to interior installations, rooftops, parking lot conversions or temporary installations of fields or putting greens, nothing makes more economical sense than UltraBaseSystems®. We should be great… we pioneered and patented the technology a decade ago! Install it for a lifetime or remove it in a day, you never lose your investment with UltraBaseSystems®.